Ever be so entranced by a large scale print that you just HAVE TO HAVE it? But simultaneously be completely petrified of how to use it? The entire concept of using a large scale so it is nicely showcased in a layout that is very familiar, yet new is the hallmark of 9-Patch Pizzazz. I had a large scale floral from "someplace". I'm quite sure I didn't buy it; it's not anywhere NEAR the colors that I prefer ... certainly these colors are nowhere in my house or wardrobe. So, I think I acquired it from my Mom's stash? Or maybe it was a donation from Freecycle? ... I'm not quite sure .. but there was a whole bunch of it. 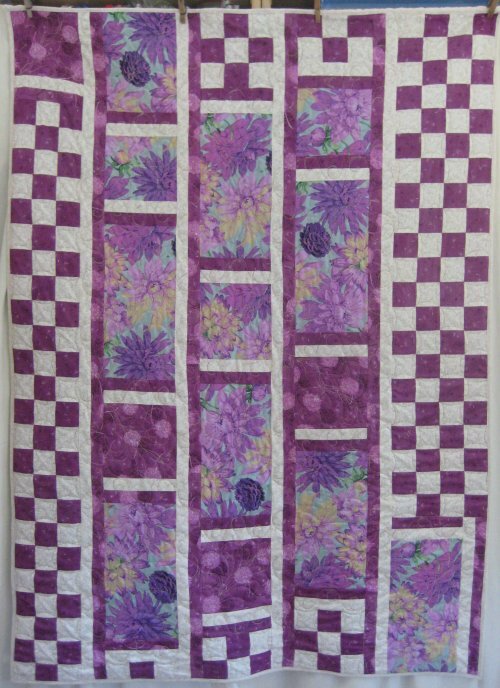 I pulled out my "9-Patch Pizzazz: fast, fun & finished in a day" by Judy Sisneros. The "Flower Power" layout caught my eye and I was off to the races. This layout uses only 2 coordinating fabrics to create a 2-color sashing between the blocks, as well as all the checkerboard areas (i.e. the 9 patches). 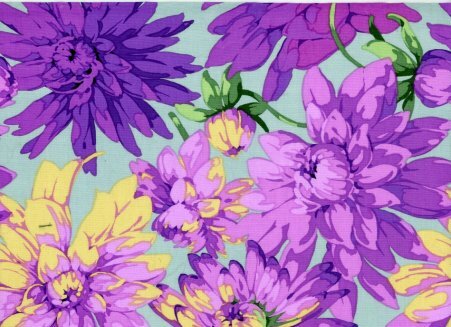 The purples in this floral are a very bizarre, weird shade. I have no Crayola 64 color name to describe it! It's not magenta, it's not red-violet nor even violet-red, but does reside somewhere in that color family. A very, very strange shade, indeed. But as I was pawing through my purple stash bin, what did I find???? The EXACT shade of purple that I needed for one of the companion fabrics! I have no idea why I would have ever bought that piece of fabric but there it was. The other fabric I chose was a white tone on tone. I made endless strip sets of the purple and white fabrics, sub-cutting them into 2 patch units and then re-sewing them into the checkerboard pieces. The 2-color sashings were sewn between the vertical column units and also between the columns themselves. If you were careful about cutting the focus fabric pieces, then the whole top is assembled very easily. I backed this top with a fleece that, miracuously had the same purple color family in it. Since fleece is warm enough all by itself, I didn't use any batting. It has occured to me that, eventhough I have maintained that this particular shade of purple is weird and there is no way I would have voluntarily chosen it to be in my stash .... isn't it just a bit strange that I was able to FIND coordinating fabric AND fleece to go with the focus fabric? Doesn't that say that perhaps, this weird shade of purple actually DOES call out to me? Nah. It's still weird and I have no idea how it got into my house. So, for the checkerboard areas, I chose a tried-and-true .. and attractive! ... continuous curve quilting design. I actually really like the way these curves give the impression of interlocking circles and soften the lines of the hard angular checkerboard. I know, for myself, that I tend not to be terribly consistent with curves. Smooth, nice looking curves are difficult to achieve, especially if they are on a large scale. Eventhough the checkboard areas of this quilt are small, I still felt that they needed to be EVEN and CONSISTENT and SMOOTH .. something my free-handing lacks at this time. It just so happened that I possess a nifty tool designed to help with close-in quilting around appliques, the Appliquide by Deloa Jones. I like it when a tool can serve multiple purposes and although I'm sure Deloa had not intended the Appliguide to be a curve template, that is EXACTLY what I used it for on this quilt! The curve of this tool gave me a beautifully smooth curve in the checkerboard areas! It turned out so very nicely! With that faint praise in mind (smile), I did Hooked on Feathers in all the focus print and coordinating print areas. I'm very pleased with the technical aspect of the hooked feathers ... but ... and here is something for all quilters to consider and be aware of .... prints hide quilting. 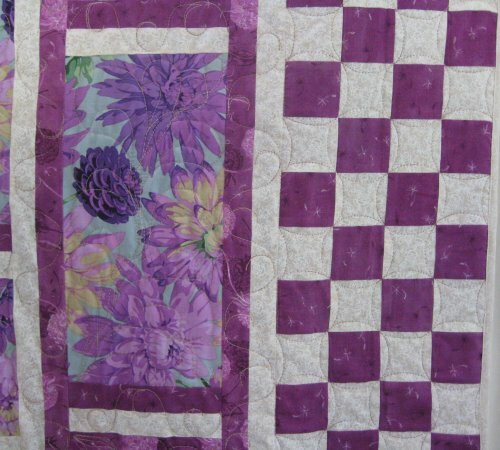 If you use a highly contrasting thread, it may stand out more, but it's not going to look the same as when you quilt on a fabric that reads as a solid. Take a look at the picture on the right. You can see the feathers in the "solid" purple fabric .. but you'll have a more difficult time seeing those feathers in the focus fabric areas. Because I am quilting for myself, I can choose to do fancier designs in areas that might not show off the quilting. I'm not paying hard money for it. 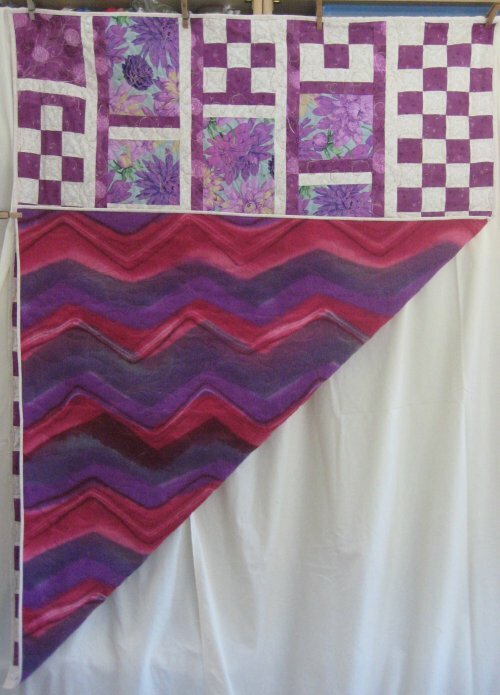 If you ARE paying a longarm quilting to do your quilting, be sure to discuss with her how the quilting will show up in the different areas of your quilt. I wouldn't think you would want to pay for intricate quilting that can't be seen readily. Here's another picture of all the quilting ... including the swirly curly done in the sashing. The swirly curly is a design that I learned from Carla Barrett's tutorial pages for sashing designs. This has got to be my all-time favorite design for sashings! It is so easy to do the basic version and the variations are wonderful also. Praise the Lord, several months down the line, she called me to say that the tumors had shrunk to *nothing*. While she still has to continue to take medicines and occassional monitoring, miracles DO happen. For this I am very grateful. Addendum: Sadly, my cousin Jan experienced setbacks. The tumor in her brain returned; the gamma knife surgery wasn't as successful as everyone had hoped. In March 2011, she underwent brain surgery to physically remove the tumor but *that* surgery didn't go as well as planned. On April 20, 2011, my cousin Jan passed away in Sacramento, CA. She leaves behind a massively grieving husband, a very sad daughter, son-in-law and 2 grandsons. We, her extended family, are also very saddened to lose this vibrant woman. 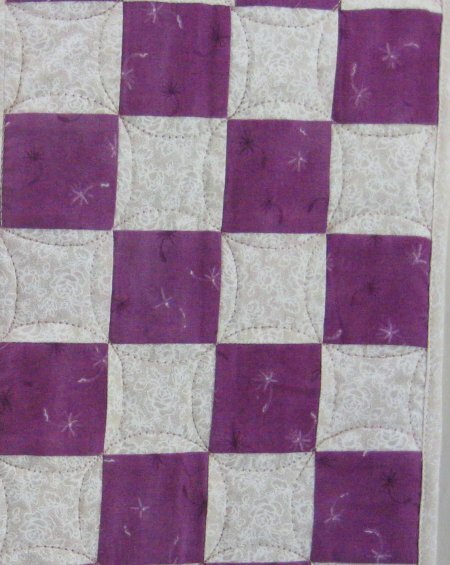 I had a bit of the focus fabric leftover from this quilt and made another 9-Patch Pizzazz quilt using it. This other quilt is the "Lilly Pond" layout and is a charity quilt for the Bay Area Crisis Nursery in Concord, CA. 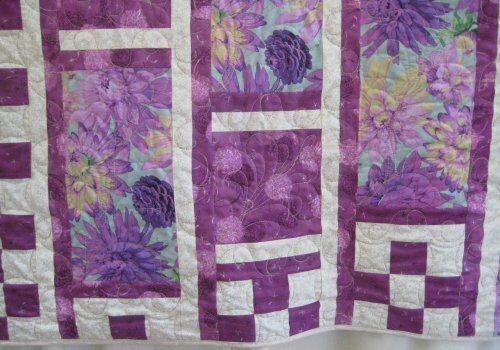 You can read about the "Lilly Pond" quilt on its own webpage: 9-Patch Pizzazz Lilly Pond.